← William Carey – The Father of modern gospel missions. An Anglican priest, Whitefield would become one of the most well-known preachers in his time and remembered by everyone who has even a slight interest in preachers and the spread of Christianity in the United States in the early years of the country. Whitefield was a small man, cross-eyed, but preached with such zeal that he preached the gospel to tens of thousands in the open air, often to more than 10,000 in one event. 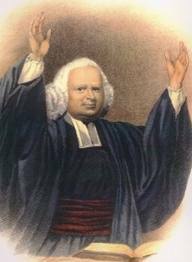 Whitfield eventually would become one of the founders of Methodism and he was the voice God used to shake the colonies in what has become known as the “Great Awakening” of 1740. He preached every day for months bringing the good news to multiplied thousands. One of the people who became very fond of this little, odd preacher was none other than Benjamin Franklin. Whitefield is one of the key figures God used powerfully in modern-day gospel preaching. He also founded churches and an orphanage. He was one of the first to preach to slaves in America. He is buried in a crypt under the pulpit of a Presbyterian church in Mass. At his request. He was born in 1714 and died in 1770. I think the death date should be 1770. Thanks for reading and for the comment. I suppose I had the year of some of his most important preaching on my mind and simply stated his date of death wrong.